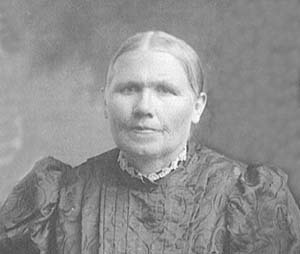 Elisabeth Voss was born on 1 June 1844 in Altenilpe, Westfalen, Preussen, a small German farming community, to Joseph and Franzisca (Knoche) Voss. She was christened on 3 June 1844 in the Catholic Church in Dorlar, Westfalen, Preussen. Her godparents were Joseph Schrage and Elisabeth Pape. She married Johann Joseph Knoche, son of Johann Knoche and Maria Franzisca Tillmann, on 30 August 1864 in the Catholic Church in Dorlar, a larger city. Witnesses were Küster Berles and Mrs. Adolph Brechting of Dorlar and Lorenz Voss. At that time Johann was 31 and Elisabeth, 20. They may have had as many as 14 children, but records have not been found for all of them. Later in the fall of 1907, after her widowed daughter, Minnie, moved her large family to the old Greiner farm in Detroit, Elisabeth worried that Wilhelmina would need help and decided to visit them. Back when Minnie was about 17, Elisabeth encouraged her daughter to seize the opportunity to emigrate to the United States, hoping she would have a better life there. Elisabeth stayed with the family for a time, but tended to get on everyone's nerves. She would complain about the boys and want to get out of the house, but then feel she should be back helping. Life was just too unsettling and different for her on the Schulte farm. Elisabeth died, probably due to the world-wide influenza epidemic, 16 November 1918 in Altenilpe.